This cove is superbly conditioned, and the access is really easy, as it has a large car park at its entrance. 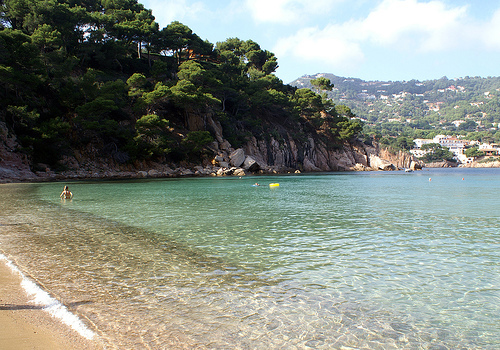 To get there, take the road that connects Begur and Palafrugell villages and take the signposted deviation. 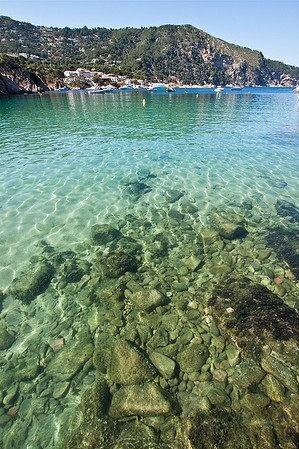 Cala Aiguablava is really lively in midsummer. It has excellent services, as showers, parking, kayak rental and a bar-restaurant. Aiguablava is 75 meters long and about 25 meters wide. You will find showers. 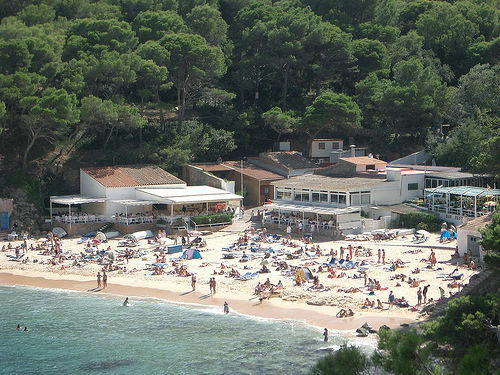 The cove is surrounded by greenery, and a fairly privileged geographical position, as you will be able to admire, far away in north direction, the Cap de Begur, as well as the mountains surrounding the village of Begur in the east. To the right of the creek, before descending the stairs of access, in the parking, begins a beautiful coastal path that, protected by the shade of pine trees and a wooden railing, and after offering beautiful views over the water, will lead you to an imposing hotel located next to this cove, in the Punta des Mut cape: we are talking about the Parador Nacional Aiguablava, the only hotel of this kind in the province of Girona. It was inaugurated in 1966, and its creation reflects the objective of the government to boost tourism in the area. 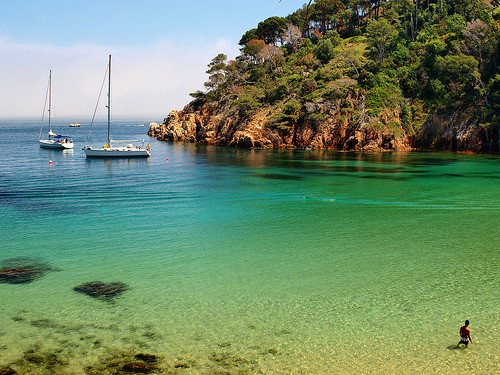 The Parador is open throughout the year and broadens the demand of tourists who wish to visit Begur in winter. North of the creek begins another coastal path that, after a succession of small coves and little ports, brings us finally to Fornells port and Platja Fonda. This way can be taken through the coastal path that starts on the left side of Cala Aiguablava. From Aiguablava leave many canoes and small boats to the south of its coast, right to the most attractive sea caves of the Costa Brava and the entire Catalan coast, including the most famous, the Cova d’en Gispert, which allows passage of a canoe until the end of it, 150 meters long inside.